This is beautiful! I'm trying to make one, but having a hard time with the light staying where I want it. How did you get your to stay in place that high? I really love your glass block - it is just stunning! I have a question for you, how did you adhere the paper to the block? caroleanne@mirrorimagedecals.com, sorry it's not just Carol - just still have the question of how you adhered the paper - HE HE I am sorry I was trying to go tooooo fast! 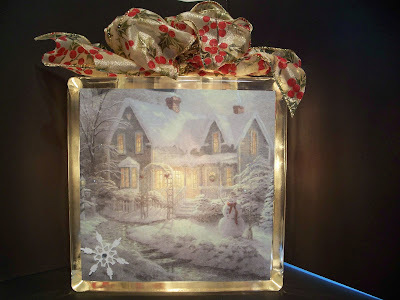 I love this Kinkade glass block...I would love to see instructions on how to do it!